This ride heads east for a scenic loop around Livermore Valley through the country back roads from Collier Canyon Rd to the wind farms along Patterson Pass and Altamont Pass. Exit Danville onto Camino Tassajara; this road heads south out of town towards the back country with wide open pastoral ranch lands and rolling hills through the unincorporated town of Tassajara. These golden ranch lands are populated with a few working cattle ranches and a large horse boarding facility. The gentle rolling terrain comes to a T junction with Portola Ave.
Head east on Portola Ave into Livermore; the road crosses over I-580 and continues along the residential neighborhoods out to First St & N Mines Rd. Continue east on Patterson Pass Rd; the road spans 11.5 miles east from Mines Rd to Midway Rd. The first few miles travels through the flat Industrial Park area of Livermore out past Greenville Rd. Patterson Pass Rd continues out through the flat valley for the next 1.2 miles to S Flynn Rd. Patterson Pass Rd up to the junction with Cross Rd. At Cross Rd, Patterson Pass begins to climb along the back ridge for the next 1.5 mile with gradient ranges of 7-11%. The last bit up to the summit kicks up to steep grades of 12-14%! The summit offer fabulous views of the wind farms lining the hillsides in the distance! The descent on Patterson Pass heading east to Midway Rd is fast! it winds down through the open grasslands with hilltop windmills. Continue west on Altamont Pass Rd; it stretches 8.6 miles through the scenic Altamont windmill farms out towards Livermore Valley and Greenville Rd. Altamont Pass Rd gently winds down along the RR tracks and I-580 into Livermore Valley at Northfront Rd. Turn right on N Vasco Rd and make your way out of the city through a series of turns on Scenic, Broadmoor, Dalton and Ames to Raymond Rd. Weave through the open valley on Raymond and Dagnino to May School Rd and enjoy the fantastic views of the surrounding rolling hills and country ranches. Head NW on N Livermore Ave to Manning Rd and take in the splendid country landscape! Highland Rd continues along the fenced pastures around Reinstein Ranch before dropping down to the lower valley at the intersection with Collier Canyon Rd. Retrace route back along Highland Rd to Camino Tassajara. Return west along Camino Tassajara back to Danville. 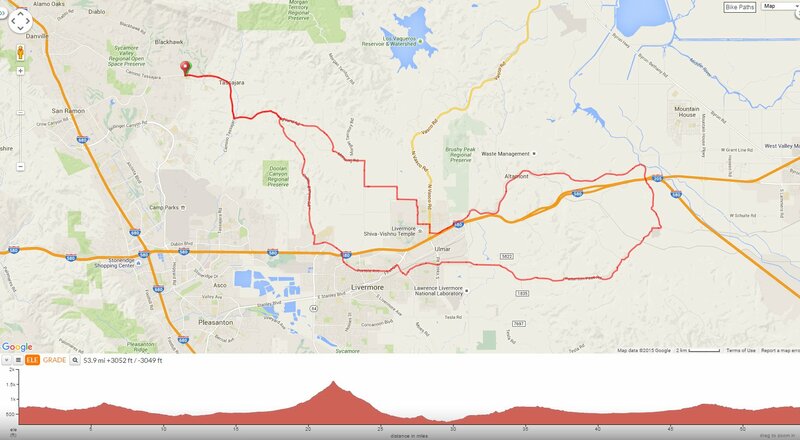 This is a beautiful scenic ride around Livermore Valley to the remote climbs up Patterson Pass and Altamont Pass. You’ll enjoy the beautiful rolling hills and quiet country back roads! Weather: Sunny and cool with clear blue skies. Temps ranged from the low 50’s to the mid 60’s with brisk NE winds.